DENVER, CO—A coalition of environmental groups today filed a lawsuit in federal court to prevent additional diversions from the already struggling Colorado River. The suit questions the need for the Windy Gap Firming Project, which is a plan to divert on average an additional 30,000 acre-feet or 9 billion gallons of water annually from our state’s namesake river to pipe, store, and use on the Front Range. Save the Colorado, Save the Poudre, WildEarth Guardians, Living Rivers and Waterkeeper Alliance challenge the environmental review and approvals by the U.S. Bureau of Reclamation and the U.S. Army Corps of Engineers that gave the green light for this new diversion. 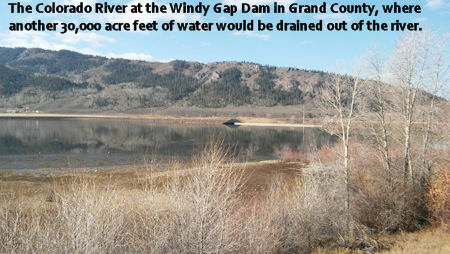 The Windy Gap Firming Project is a proposal by the Northern Colorado Water Conservancy District seeking to divert more water from the Colorado River, pump it through the existing facilities of the Colorado-Big Thompson Project to the eastern slope, store the water in the new 90,000 acre-feet Chimney Hollow reservoir near Loveland, and finally deliver it for municipal and industrial uses by the project participants. The Firming Project comes on the heels of the former and botched Windy Gap Project—that sought to increase diversions from the Colorado River in 1985 to deliver to the Front Range—but has largely failed to deliver the expected 56,000 acre-feet. The Windy Gap “Firming Project” hopes to make up for the original project’s shortfalls. Reclamation and the Corps spent more than a decade conducting the environmental review of the Windy Gap Firming Project; however, the agencies’ effort was woefully inadequate. As one example, the “alternatives analysis” did not analyze any actual alternatives to the project and only discussed options that would further drain the Colorado River. Even worse, the Bureau and Corps’ environmental review concluded that the project was the “Least Environmentally Damaging Practicable Alternative” without actually analyzing any true alternatives including water conservation, water recycling, or obtaining water from farmers, all tried and true methods for getting new water on the Front Range of Colorado. The Colorado River in Grand County already loses 70 percent of its flow by the time it reaches the town of Hot Sulphur Springs. If the Windy Gap Firming Project is built – along with Denver Water’s proposed Moffat Project – that loss would reach 80 percent. Climate change is also taking its toll on the Colorado River. A new scientific article released this week by the U.S. Geologic Survey, Evidence that Recent Warming is Reducing Upper Colorado River Flows, concluded that temperature increases over the past three decades have already reduced flows in the Upper Colorado River Basin by 7 percent. These significant flow reductions due to increasing temperature are the largest ever documented. The predicted flow declines for the Upper Colorado River Basin for the remainder of the century are equally bleak and estimate flow declines as high as 40 percent. The organizations participating in this litigation are represented by the Environmental Law Clinic at the University of Denver Sturm College of Law. Save the Colorado is a grassroots nonprofit organization whose mission is to protect and restore the Colorado River and its tributaries. For more information please visit: www.savethecolorado.org. Save the Poudre: Poudre Waterkeeper is a nonprofit organization whose mission is to protect and restore the Cache la Poudre River of northern Colorado. For more information please visit: www.savethepoudre.org. WildEarth Guardians is a non-profit organization working for over 25 years to protect and restore the wildlife, wild places, wild rivers, and health of the American West. For more information please visit: www.wildearthguardians.org. Waterkeeper Alliance is a global movement uniting more than 300 Waterkeeper Organizations and Affiliates around the world, focusing citizen action on issues that affect our waterways, from pollution to climate change. The Waterkeeper movement patrols and protects over 2.5 million square miles of rivers, lakes and coastlines in the Americas, Europe, Australia, Asia, and Africa. For more information please visit: www.waterkeeper.org. Living Rivers is a nonprofit organization working to revive the Colorado River. For more information please visit: www.livingrivers.org. Colorado River Update: Former Commissioner of Reclamation Joins Our Board! Colorado River Water Storage at Lowest Point in History!